A few weeks ago (Saturday 24 September), the men of Hikoi4Life, Les Hokianga, Jack Fraser and Darryl Mohi, hosted the wānanga Maunga ki te Moana as part of the Toi Tangata Atua Matua Wānanga series. This wānanga was located in what is known as the fruit bowl of Aotearoa: Ngāti Kahungunu ki Heretaunga. The organisation Hikoi4Life started with a haerenga back in 2010, these inspirational men led a hikoi on their bikes from Heretaunga to Te Whanganui a Tara ki te Upoko o te Ika a Maui carrying precious cargo to hand deliver to the then Minister for Whānau Ora, Dame Tariana Turia. 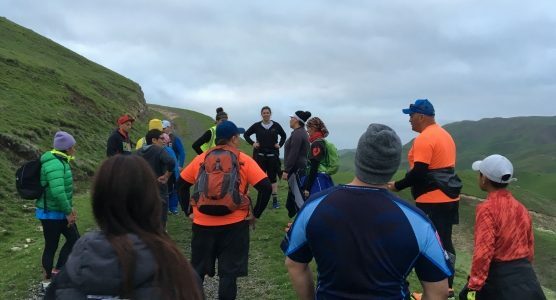 This precious cargo was a proposal for a ‘whānau centered wellness program’ underpinned by the use of pedometers to track our tupuna hikoi from Hawaii, around Rapanui to Cape Reinga. From there, their journey has continued to evolve. Last year Toi Tangata had the privilege of having Jack and Darryl attend all of our Atua Matua wānanga led by Dr. Ihirangi Heke. 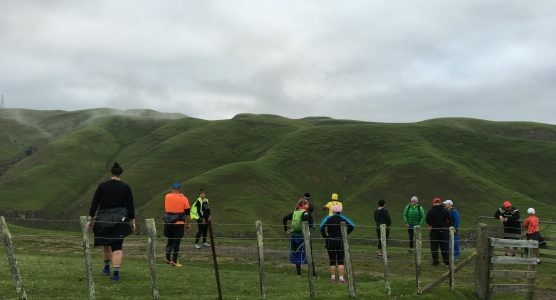 The trials and tribulations faced on these wānanga proved that in order to pursue mātauranga, you have to earn it and these men have certainly done that. The kaupapa of the Maunga ki te Moana wānanga was reconnecting to whakapapa through ngā maunga tokotoru, Hinerākau, Te Mata O Rongokako and Kahuranaki. The first two maunga we ascended were Hinerākau, the daughter of a Pakipaki chief by the name of Ngarengare, and Te Mata o Rongokako, son of Tamatea mai Tawhiti and grandfather of Kahungunu. It was interesting to find, on both maunga, fossils of shells from Tangaroa. These created a lot of kōrero not only around Maui and the fish, but also the reality that where we were standing was once under water. Te Mata was definitely an awesome experience. We traversed through Pari Karangarangamaha, the echoing valley, then up the side and along some very narrow and gnarly goat tracks; not cool if you have a fear of heights! There was a rewarding feeling descending the maunga and watching cars drive up knowing that you had earned your matauranga through physical interaction. Kahuranaki was our last maunga to visit, The name our ancestors used in the past was Kahuraanake. Kahuranaki being the whenua beneath and Kahuraanake the papa. Kahuraanake, meaning the long look (as explained by koro Jerry Hapuku, a direct descendant of autonomous ancestor Te Hapuku), was used as a landmark by our tupuna travelling along from Mahia or from the coast. Whaia te iti kahurangi, me he tuohu koe, me he maunga teitei. Pursue that which is precious do not be deterred by anything less than a lofty mountain. Our final hikoi up Maunga Kahuranaki is best described by this whakatauki. Kahuranaki, he maunga ā ō tātou tupuna, was a fitting way to end our haerenga as it is a maunga that is used in most pepeha for those who whakapapa to Ngāti Kahungunu ki Heretaunga. 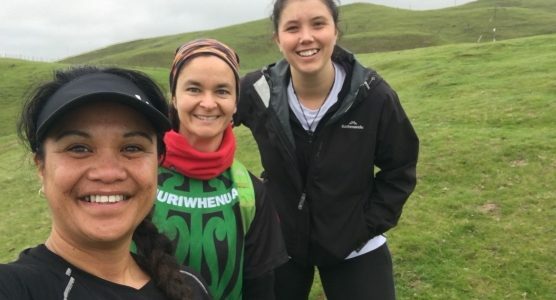 Connecting to your maunga or your awa is a right of passage to bring life to your whakapapa. Creating the opportunity for your maunga to interact with you, find out who you are and what you are doing there also gives you a chance to understand more about yourself and what makes you who you are through the challenges the maunga will present. For example, steep inclines versus a gradual incline; which path would you take? The idea of reconnecting with your maunga is not to fear it, but to take the thrashing you will feel physically and utilise the opportunity of engaging with matauranga; keeping in mind that our maunga and awa are the keepers of knowledge and therefore the oldest learning institutes in the world. Big mihi to Hikoi4Life for your manaakitanga and the opportunity you created for us to engage with our maunga, our tipua. I will leave you with this whakatauki, given to us by Koro Jerry Hapuku to akiaki us on our journey. Kua haere koe ki te tuara ki ō tupuna, kua kai koe ki ngā whetū ō te rangi. If you travel on the back of your ancestors, you will reach the stars in the heavens.